-Supports ad-hoc and infrastructure mode Supports Windows 8/7/Vista/XP/2000 32/64bit, MAC OS 10x and above and Ubuntu linux. Leoxsys WiFi LEO-HG300N Wireless 3dBi High Gain USB Adapter is high-gain wireless USB adapter which provides a simple and easy way to add or upgrade wireless connectivity to your desktop or notebook computer. This LEO-HG300N high-gain USB adapter supports higher data rate up to 300Mpbs when connecting with wireless 802.11n device. You can just plug it into computer's USB port and enjoy unbelievably high-speed wireless network access. Leoxsys WiFi LEO-HG300N Wireless 3dBi High Gain USB Adapter complies with wireless 802.11N standards along with backword compatible with 802.11b/g. With built-in with the latest wireless technology, it can increase the coverage 3 times more and reduce dead spots within the wireless range. The transmission data rate when connecting with wireless 802.11n devices is up to 300Mbps, which makes signal travel farther and maintain wireless connections much reliable than standard wireless 802.11b/g network. Leoxsys WiFi LEO-HG300N Wireless 3dBi High Gain USB Adapter is currently the smallest wireless adapter. Its Detachable/rotatable 3dBi high gain antenna makes the wireless transmission more stable and reach farther. Its compact design is convenient to carry for all mobile users. This antenna size USB adapter achieves the extraordinary performance when plugging in USB cable included in the package. Leoxsys 300Mbps WiFi High Gain Wireless USB Adapter ( LEO-HG300N) Features:-External High Gain 3dBi Detachable Antenna-Wireless N speed up to 300Mbps with2xMIMO (Multiple Input Multiple Output)-Supports 64/128 WEP, WPA /WPA2/WPA-PSK/WPA2-PSK(TKIP/AES), supports IEEE 802.1X-Supports ad-hoc and infrastructure mode Supports Windows 8/7/Vista/XP/2000 32/64bit, MAC OS 10x and above and Ubuntu linux.-Along with software utility provides quick & hassle free installation-Seamlessly compatible with 802.11n/b/g products Leoxsys WiFi LEO-HG300N Wireless 3dBi High Gain USB Adapter is high-gain wireless USB adapter which provides a simple and easy way to add or upgrade wireless connectivity to your desktop or notebook computer. This LEO-HG300N high-gain USB adapter supports higher data rate up to 300Mpbs when connecting with wireless 802.11n device. You can just plug it into computer's USB port and enjoy unbelievably high-speed wireless network access.Leoxsys WiFi LEO-HG300N Wireless 3dBi High Gain USB Adapter complies with wireless 802.11N standards along with backword compatible with 802.11b/g. With built-in with the latest wireless technology, it can increase the coverage 3 times more and reduce dead spots within the wireless range. 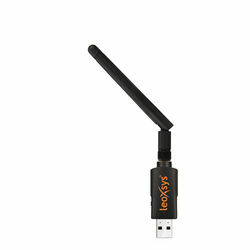 The transmission data rate when connecting with wireless 802.11n devices is up to 300Mbps, which makes signal travel farther and maintain wireless connections much reliable than standard wireless 802.11b/g network.Leoxsys WiFi LEO-HG300N Wireless 3dBi High Gain USB Adapter is currently the smallest wireless adapter. Its Detachable/rotatable 3dBi high gain antenna makes the wireless transmission more stable and reach farther. Its compact design is convenient to carry for all mobile users. This antenna size USB adapter achieves the extraordinary performance when plugging in USB cable included in the package.